We were in Tokyo for two weeks, you for work, me to be the low-maintenance writer wife who often accompanies you on these journeys. I was here to rub your back and fetch our morning coffees, to be alive with the thrill of it all, to bring back to you anecdotes of my days out touring, to be an outlet for your banter, an ear for your work woes, to exchange sarcasm and ideas and share in each others exhilarations. But in more simple terms, I came along on these trips to get what I could from you, and you from me, because otherwise, with your travel schedule, we’d never see each other. Sometimes soft, fuzzy moments—when all the world was asleep but us, or so it seemed. Rustling about at three a.m. “Go to sleep,” you say. “I can’t,” I say. All that cuddling and clawing, the reading and slapping down of books, the whispered murmurs and so on, deep into the morning of those jetlagged nights. —An oyster so big that we had to share it, me sucking down one half, you the other. —A steaming hot, brick-sized tamago that we devoured in a nanosecond. —In the background, vendors calling out to us in a language we didn’t need to understand. —A fisherman plunging his meaty, calloused hand into a bucket of oxygenated seawater to retrieve a scallop the size of his palm. 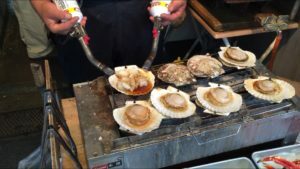 He shucked and diced it, then placed the pieces back into its shell, set the shell on a makeshift grill and commenced searing it with two blowtorches. We stared, fascinated, as the vinegar and soy juices he’d poured on top of it bubbled over. When the paper plate holding the steaming hot crustacean was at last in our hands, neither of us was willing to let go, so we just stood there holding it together. When we’d finally made it back to our hotel room, we fell face first onto the bed, where I dreamt of the strange flavors and tastes of our beginnings, where we’d started out together, from the deepest and darkest of oceans. It was only nine-thirty a.m. when we’d woken again. You put on a suit and went to negotiate a deal with a Japanese partner. I slept until the maids kicked me out (noon), and then went in search of the obscure because that’s how I was feeling—dragged around, the way you’d said it, as if my choices weren’t my own, as if I was only doing this for you. On a vague hunt for a bathhouse turned artist studio in the Yanaka district, I found myself wandering through streets that felt of another place and time—the film director Kurosawa came to mind, and all his movies you insist I watch with you—Yojimbo, Rojimbo, Akimbo—bastardising the names made me smile, was there ever a moment without you in it? 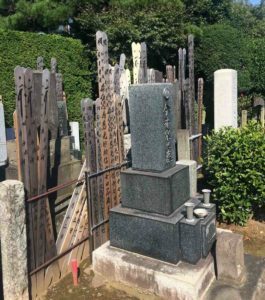 Before I knew it I found myself lost deep inside the bowels of a cemetery, where dilapidated tombs loomed large and insignificant and engraved wooden slats signifying swords were stacked everywhere. I kept looking behind me thinking that there was someone there, but it was just those swords, slapping against each other in the wind. That night, you returned from a ten-course Kaiseki business dinner awash in a waft of intoxicating scents to find me seated on the plush, windowed-walled couch of our hotel room staring out at the jewel speckled skyline, dark shadows of a river snaking below, a vast garden built by some shogun or samurai, eating rice triangles, and drinking from a bottle of convenience store sake. 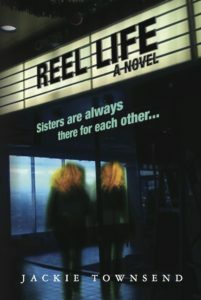 Jackie Townsend is the author of Imperfect Pairings. 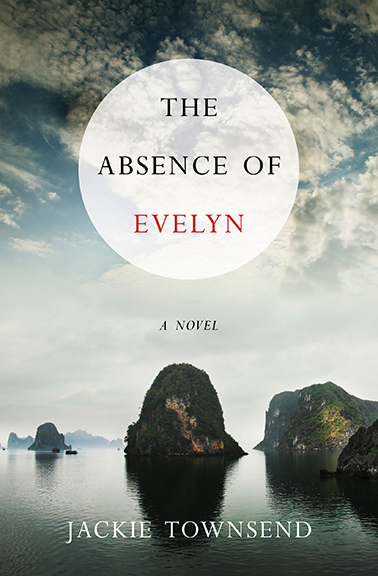 Her new book, The Absence of Evelyn, comes out in April. Posted on January 27th, 2016 You can leave a response, or trackback from your own site.